In today's magic world we have enormous amounts of imitation, which is often more akin to theft and copying than imitation. One recent example was the fellow who stole Piff The Magic Dragon's act and presented it on TV as if it were his own. I've also seen a video on Youtube of a fellow performing Lance Burton's Dove Act copying every detail down to the costume and music. This stuff sadly has been going on forever and happens in other areas of entertainment as well. It's one thing to be inspired by another performer, it's another to steal their act. If the originator has passed on then it's a different issue. Though unless one is presenting a tribute act, it's probably best to still change the act somewhat. I thought I'd share some examples from a bygone era to show how far back this goes. 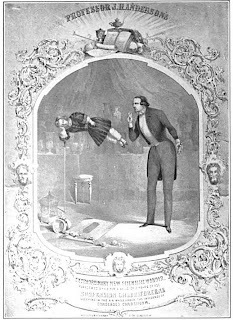 We'll start with Robert Houdin the great french magician. Many performers ripped off the routines of Robert-Houdin. But if you read Harry Houdini's book "The Unmasking of Robert-Houdin" you'd think that everything Robert-Houdin did was stolen also. I find this book to have some interesting historical facts, but I don't always agree with Houdini's conclusions. There is a wonderful routine called The Pastry Chef of the Palais Royal which Robert-Houdin presented. In his routine, a miniature model of a bakery sits upon a table. It appears to be mechanical in nature, as Robert-Houdin must wind it up in the manner of a music box. Out comes a pastry chef holding a tray to take the order. The magician tells the chef what an audience member has selected off a menu of pastries, and the chef turns and goes back inside. The audience can see other mechanical men rolling the pastries and working in the kitchen. A few moments later the mechanical chef figure comes back out with the exact item the person from the audience requested. A marvel of the time. But was it original? If we are to believe Houdini, no way was it original. In fact, Houdini does a fine job of proving that a routine of this nature existed before Robert-Houdin. In his book he says "the trick appears first, not as a confectioners shop with small figures at work, but as a fruitery, then again as a Dutch Coffee house, then as a Russian Inn, from which ten sorts of liquor were served. Finally in 1823, it is featured under the name that made it famous, The Confectioners Shop." So the effect did seem to exist prior to Robert-Houdin. But I tend to think Robert-Houdin was presenting his version of an already existing routine. 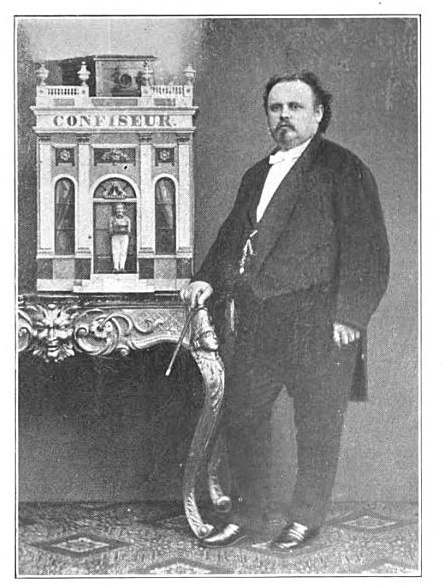 The image on the right is that of french magician Ernest Basch, and he is standing near what he claimed was Robert-Houdin's original Pastry Chef automaton. However, if you look at the picture above, you'll see it is clearly not the same. This black and white image was from Houdini's book. It does show that there were other automaton's of this nature out there and it also shows that Robert-Houdin's actual automaton was different. So I think this was more a case of imitation not theft. Now let's look at William Henry Palmer. He first saw Robert-Houdin perform in London and became interested in magic. When he decided to perform magic himself he changed his name to Robert Heller. It's said that he chose the name 'Robert' from Robert-Houdin, the name Heller from pianist Stephan Heller. Ok, he was inspired by Robert-Houdin, but read on. Robert Heller took his imitation a step further and even performed with a french accent initially. There is no denying he copied Robert-Houdin's act. In the book 'The Annals of Conjuring' by Sidney W. Clarke, there is a list of 15 routines presented by Heller and the exact same 15 in the same order presented by Robert-Houdin. Heller did give the routines 'slightly' different names, as if that made a difference. Worse yet, he claimed to have created the magic in his show. 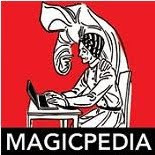 This bit of bragging was common among many magicians. Eventually Heller dropped the accent and found his own style. He met with real success when he stopped trying to be Houdin and instead performed as HELLER. John Henry Anderson, The Great Wizard of the North, claimed to have invented a trick that he called "Suspension Chloroforeene" which was amazingly similar to Robert-Houdin's invention called "The Ethereal Suspension". In the Houdin version, his son was placed between upright walking sticks and a bottle of ether was held below his nose briefly. Backstage, an assistant with a hand held fan made sure the smell of ether made it's way into the audience as well so as to increase the theatricality of the effect. The boy passed out from the ether and apparently became as light as a feather. To prove this, Robert-Houdin removed one of the walking sticks and lifted his son up and showed that he could actually rest easily upon the other. In the John Henry Anderson routine, Chloroform was used instead of ether, other than that the routine was exactly the same. 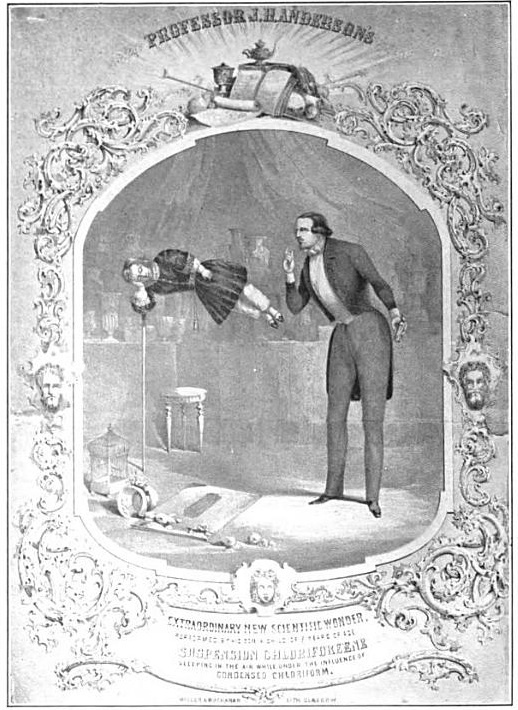 Anderson, also presented the Magic Scrapbook, known as the Artist's Portfolio in Houdin's act and the Second Sight routine, which went by the same name in Robert-Houdin's show. Let's take a look at Harry Kellar. Notice the side by side photos below. Robert Heller is on the left and a young Harry Kellar is on the right. They look very much alike. Today we most often think of Kellar as the older, clean shaven, balding gentleman, but in his younger days he sported a rather large mustache. As best I can tell, he shaved it off around 1894 because the first Kellar posters without the mustache appeared that year. I wondered if he wore this mustache to look more like Heller. However, I think it was more the fashion of the time. Though the two gentleman do look very much alike, Kellar actually tried to distance himself from Robert Heller. Harry's last name was actually spelled KELLER, but he altered the spelling because it looked too much like HELLER. His act was fairly different from that of Robert Heller with the exception of the spirit manifestations that many performers of the day were doing. Harry Kellar had worked for the Davenport Brothers, the creator of the Spirit Cabinet act and he left their employment somewhat disgruntled. Upon his exit he took with him another Davenport employee, William Fay. Kellar and Fay teamed up and began to present their version of the Spirit Cabinet. Harry Kellar did get something from Robert Heller though, but it was after Heller had died. When Robert Heller presented his Second Sight Act it was always with his 'so-called' sister Ms. Haidee Heller. Well, now that Robert Heller had passed on, Haidee, who was no relation, was off presenting the act with a new partner. In 1880, Kellar met her while he was working in Scotland and hired her and her partner to present their act in his show. 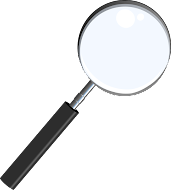 A few years later, Kellar and his wife Eva began presenting a Second Sight Act. I wonder where he learned that from? Kellar's most frequent target was John Nevil Maskylene of Egyptian Hall Fame. 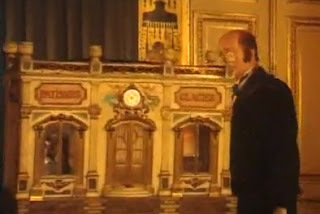 In fact, it was at Egyptian Hall that Kellar saw Dekolta present his Vanishing Bird Cage Trick. Kellar purchased a copy of the cage from a relative of DeKolta's, though apparently DeKolta himself was unaware of this transaction. A somewhat shady deal. A short time later Kellar hired a mechanic to make a copy of John Nevil Maskelyene's popular automaton PSYCHO. Kellar even called his version PSYCHO as well, though when he played England, he changed the name temporarily to Arno. Kellar continued to go back to the 'Maskelyne Magic Well' and steal not just automaton but illusions as well. At one point he tried to get permission to do Maskelyne's new Floating Lady illusion. When Maskelyne turned him down, Kellar figured out another way of getting the illusion. He offered a job to Paul Valadon, who had been working at Egyptian Hall. Paul moved to America to become part of Kellar's show. 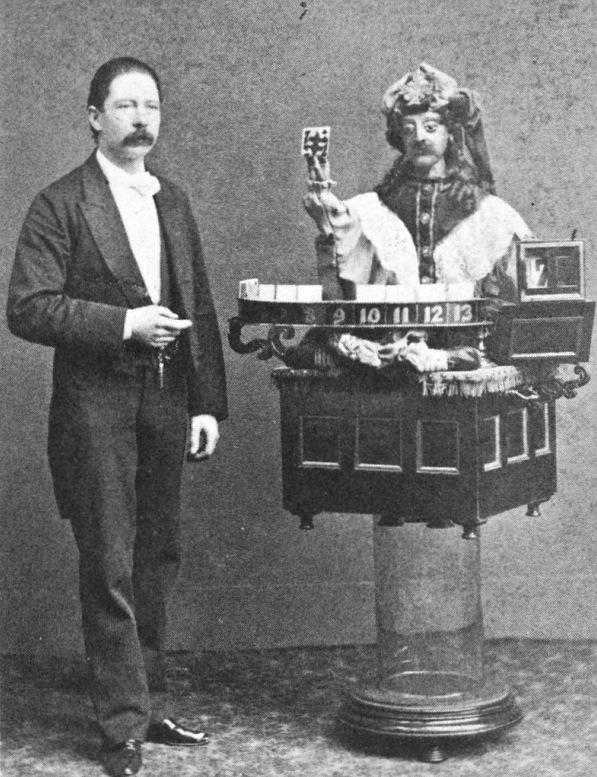 Together, Valadon and Kellar would build a version of the Maskelyne levitation. Theirs was actually an improvement over the original levitation because it was portable. Maskelyne's original was not made to travel. It just goes to show, if you've got a popular trick, act or persona, there are people out there who will copy it. I mentioned at the start that this sort of thing happens in other forms of entertainment as well. Comedians are a great example. There are some performers who have no problem with stealing jokes and routines from other comedians. Carlos Mencia and Dane Cook have both been accused of stealing jokes and routines. I've noticed in the movie industry sometimes very similar projects come out from competing studios. An example would be the movie Tombstone and then Wyatt Earp. Same story basically, same characters, two different studios. When the movie Capote came out, it was followed quickly by a movie called Infamous, which was the same story about author Truman Capote. Very recently, the movie Battleship came out at the box office and an oddly similar movie which at first had the title American Battleships appeared on the Syfy Channel. The producers of Battleship sued the producers of the other movie over the title so the second movies title was changed to American Warships. So call it what you will, copying, imitation or whatever, it existed 100 years ago and is still going strong today.